The Tahiti and Tahiti Pro architecture has been out for quite some time now. Since its release, board partners have had the time to create superior solutions compared to reference models from completely new PCB redesigns to new cooling. 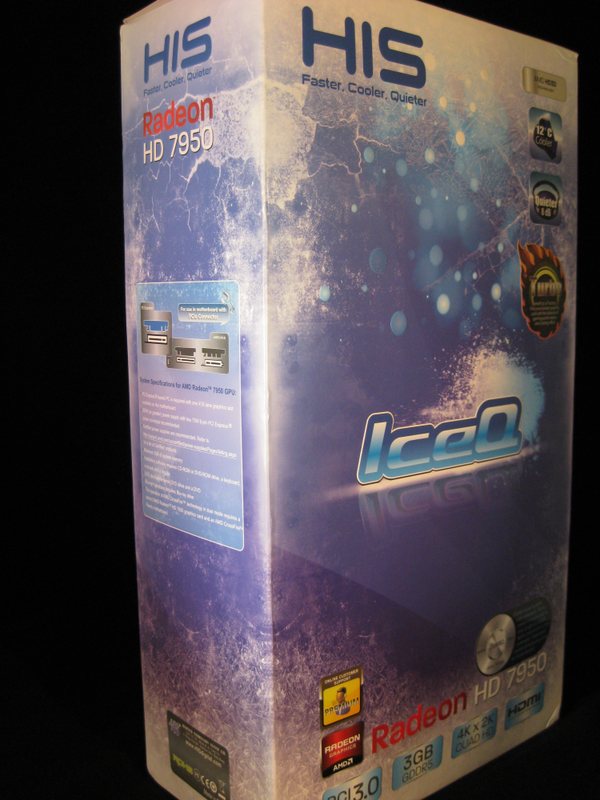 HIS brings to the table their IceQ cooler attached to a 7950. 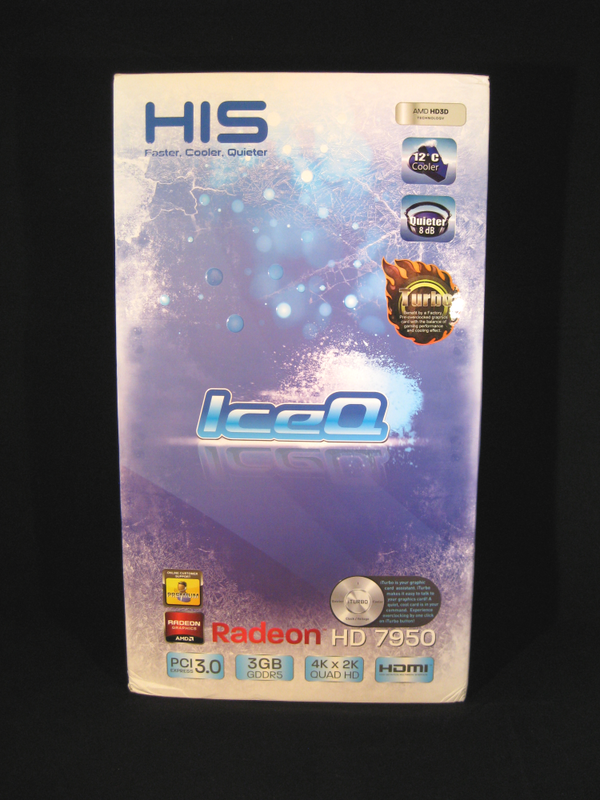 Today we will get a chance to review the HIS 7950 IceQ Turbo and see what it has to offer consumers. 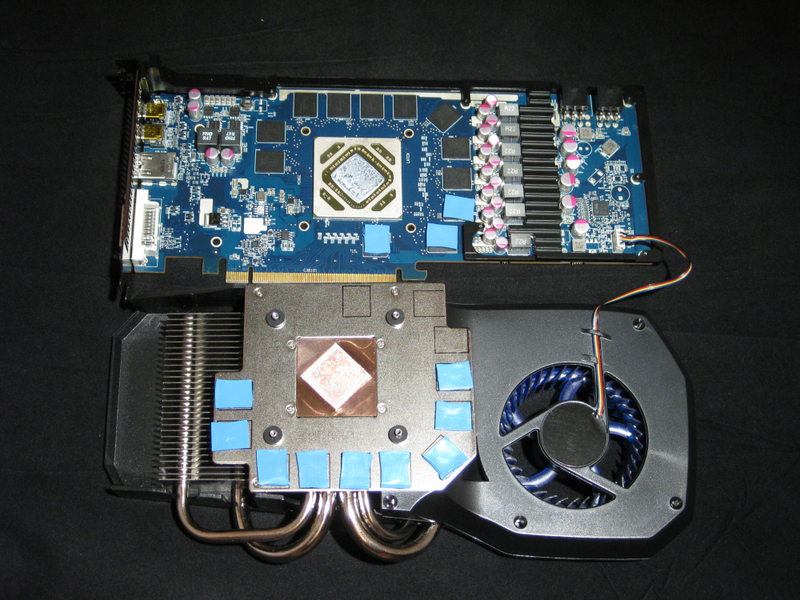 With IceQ, the card is up to 12 °C cooler than the Reference Cooler. The super large 57mm single blower fan draws massive amount of cool air to cool the GPU directly.The fan is extremely durable with a life span of up to 50,000 hours! 2x 6mm plus 2x 8mm wide heatpipes optimize cooling performance by removing heat from the core area. The extra large 115 x 94mm copper heatbase provides a 140 x 125mm large heat dissipation area. The card also features fan control and fan monitoring, you are able to read fan speed & Asic temperature from CCC or software. First up are pictures of the retail packaging. I’m sure by now we all recognize this HIS product box/branding, as we have reviewed a couple of their cards in the past. 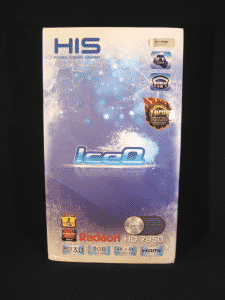 This package of course, has the IceQ name for the cooler the card is sporting, as well as showing that it is factory overclocked with the mention of “Turbo” gracing the snow and ice like front cover. 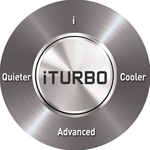 Flipping the box around you see some of the features listed, such as the IceQ heatsink being 12C cooler and 8db quieter, and the use of high-quality parts such as Solid State Chokes and Capacitors. 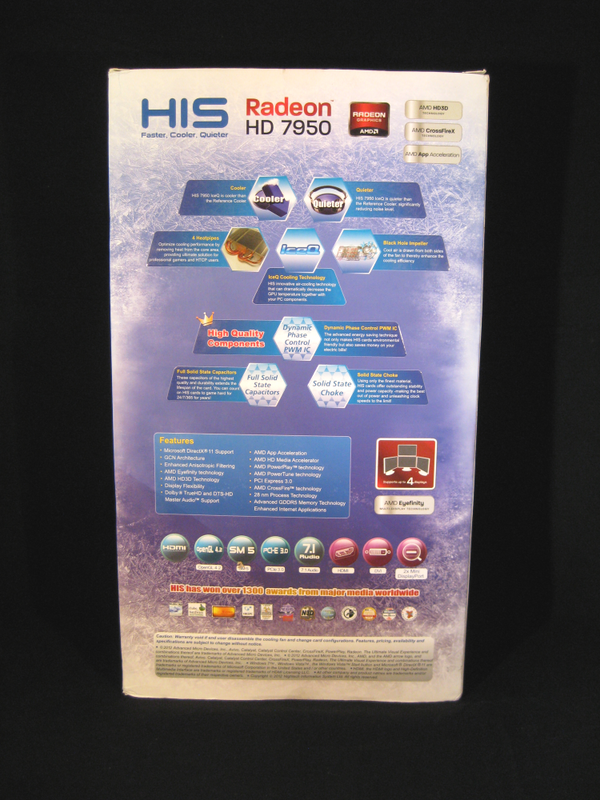 One side shows its outputs, with the other showing the model, the amount of ram, and of course that it is PCIe3. 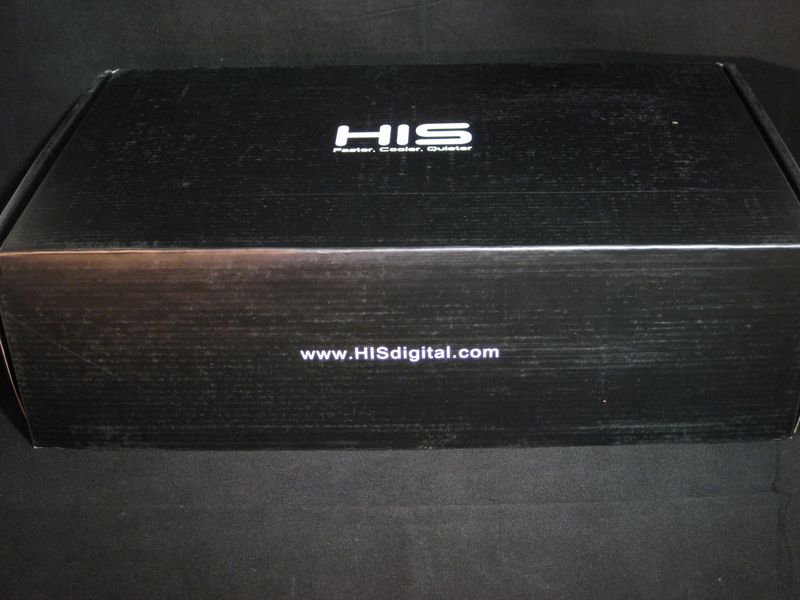 Inside the retail packaging lies a stealth black box with a white HIS label, and on the front face is the website address. Opening up the container presents you with the 7950 Iceq Turbo card fitting snug inside its form fitting foam surroundings. The card was secure inside and wasn’t going anywhere; very secure packaging. If you lift up the foam packing there is an area below it which houses the included accessories. 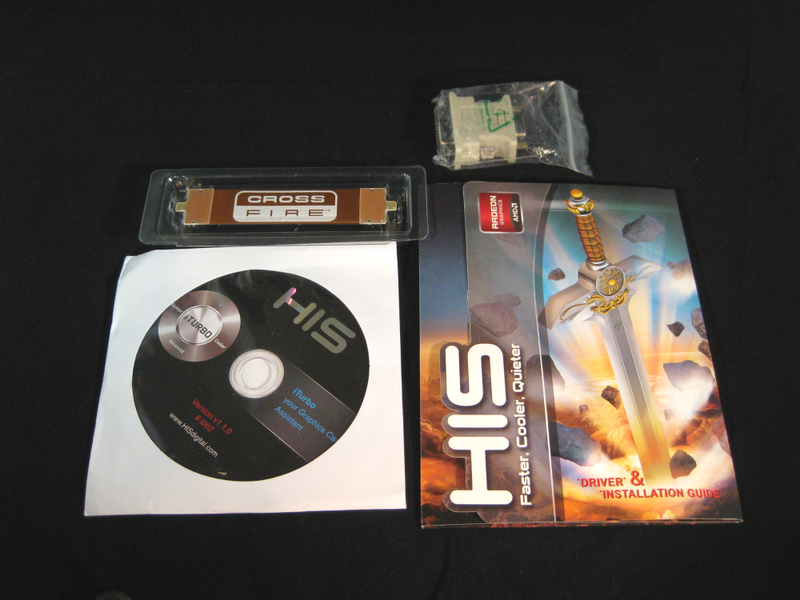 Not much to see here, just a driver disk, Crossfire bridge, and DVI to HDMI adapter. Not that you need more than that to get going in most cases, but it is nice to have perhaps 2 Molex to 6 pin connectors. Taking the card out of the box you can see a better shot of the two slot IceQ cooling solution. As you read from the specifications, it uses the black hole impeller. 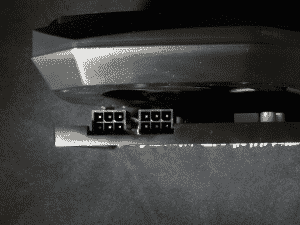 The impeller takes air in from both sides of the card which helps when using these in a Crossfire setup. The majority of the heat from the cooler does exit the case keeping things a bit cooler inside. 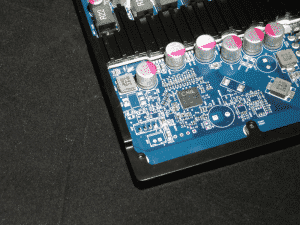 Flipping the card over there isn’t too much to see outside of the dual BIOS switch located up by the Crossfire plugs/bridges (which looks like one could tri/quad Crossfire). This is used in case you decide to flash the card and it goes wrong. You can flip to the other BIOS and flash the first one. There is a ‘backbone’ running across the top end of the card to help with any board sagging. This card uses two 6-pin PCIe connectors to get additional power. Just note that the base of the cooler and these plugs are pretty close, causing a slight problem. I have slightly larger hands (I could palm a basketball back in the day, but I don’t have fat fingers) than most, and it was a struggle for me to remove these connectors without putting significant pressure against the base of the cooler and PCB. It shouldn’t be this hard. Even a mere 1/4″ more space would resolve this issue for most people making it easier to remove. The last picture in this roundup is the out panel. 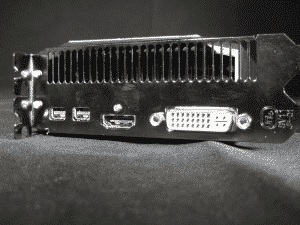 You can see it has 1 DVI-d, 1 HDMI (4.1), and 2 mini-Displayports round out its connectivity. Last are pictures of the card with the heatsink removed. First thing you can see is the TIM application wasn’t too bad from the factory, which is nice to see again. The IceQ cooler makes good contact with the cores via a copper base attached to four heatpipes that span the heatsink fins. Also note that the fan can take in air from both sides of the unit. This is an especially positive thing if you decide to use two cards in CrossfireX as it can take air from the bottom, and not just the small gap between the two cards and any heat off the back of the lower card. 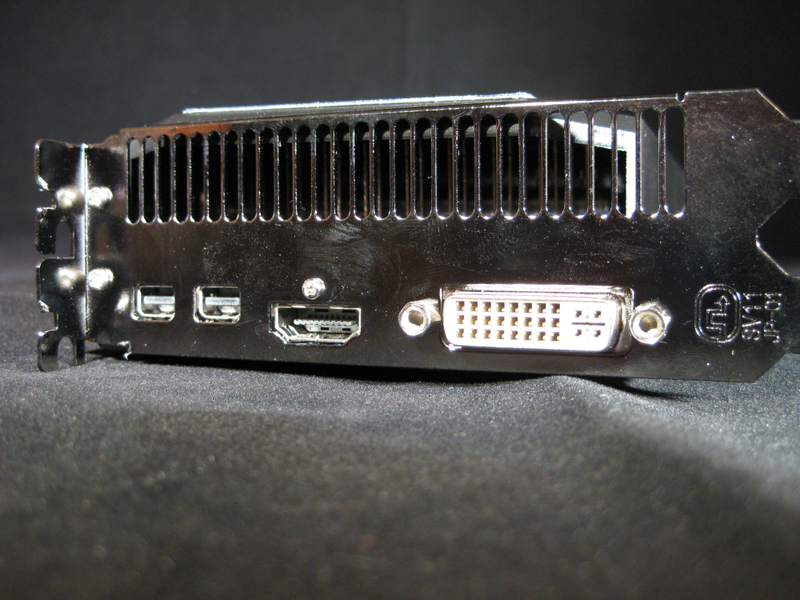 In the next picture, you can see the power section has a heatsink on it as well, keeping those components cool. 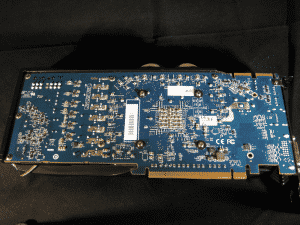 In the lower right of the second picture is the CHiL 8228G controller, which on this card gives you both core and memory voltage control; great for pushing your overclocks. Its nice to see more than one or two cards with memory voltage control, so this card at least has the tools to be overclocked well. One thing I noticed are the thick thermal pads covering the Hynix memory. I can’t imagine that thermal pads this thick are helping heat transfer very much, but they still do an effective job while overclocked with additional voltage. I still wonder if they could be a few degrees Celsius cooler with thinner pads though. But due to the heatsink having such a large gap, the thicker pads are needed. The last items I want to mention is that the fan header on the card’s PCB came off when trying to remove the power lead to the fan. While this is no big deal because I can just slide it back on, I don’t think this should happen, and perhaps its only on this sample. Finally, again I’m hoping its on this sample only, is the black hole impeller had a bit of a rattle at certain RPMs/fan speed. Once you got through this area, which for me was around 35%, it went back to pretty quiet. It seems that this impeller is just a bit off balance causing the noise. HIS came out with their iTurbo application a few months back. Not much has changed with its interface; when in its full mode, it still takes up a lot of screen real estate without graphing anything. When you first open it up however, its a small circle which isn’t nearly as bad, but clearly there are less options. In this mode one can only control your two fan presets The “i” is for information on the card, such as clockspeeds, memory amount/speed, and driver versions. 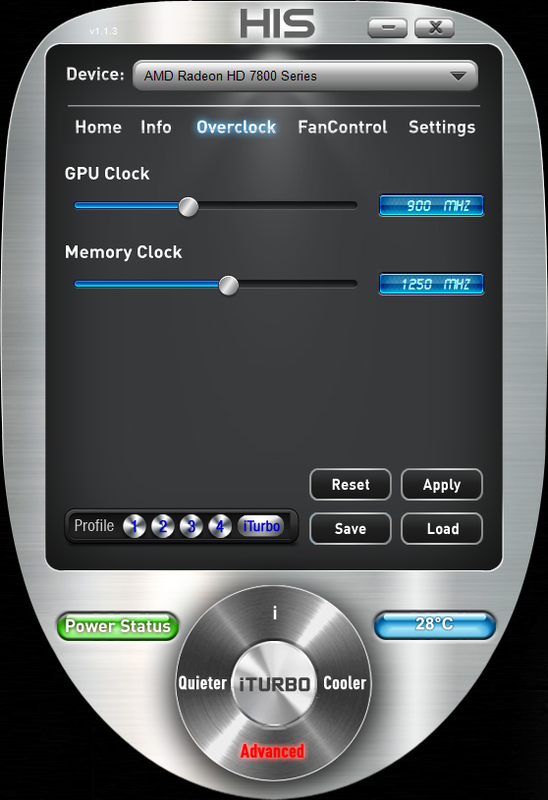 Going into the advanced mode allows for adjusting the voltages, clockspeeds, and fan control. First we will check out our synthetic benchmarks to see where this card places among GTX670, 680, and a 7870 for comparison. 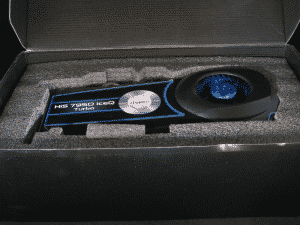 In 3DMark03, this card manages to beat out everything across the board at stock speeds coming in at 119,599. 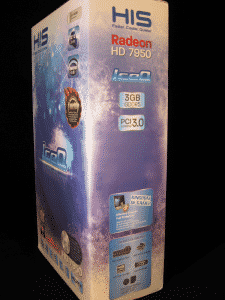 I’m thinking the AMD cards/drivers just love 03 as even the 7870 manages to edge out a 670 and a 680. When overclocked this card hit a huge score of 135,167. 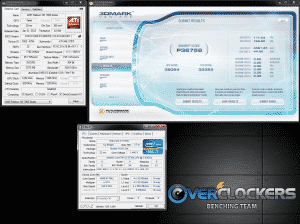 Stepping over to 3DMark Vantage, things seem to fall back to what one may expect with the 7950, sitting just below the 670 and 680 with a stock score of 34,199, Overclocked it managed to step slightly ahead of both, posting a 34,744 score. Moving on to 3DMark 11, again we see peace and harmony in the pecking order with the 7950 lagging behind the 670 and 680, with a score of 7,620 but certainly besting its little sibling, the 7870 by a fair amount (~15%). For the first set of gaming tests we will look at Alien vs Predator, Batman: Arkham City, and Battlefield 3. 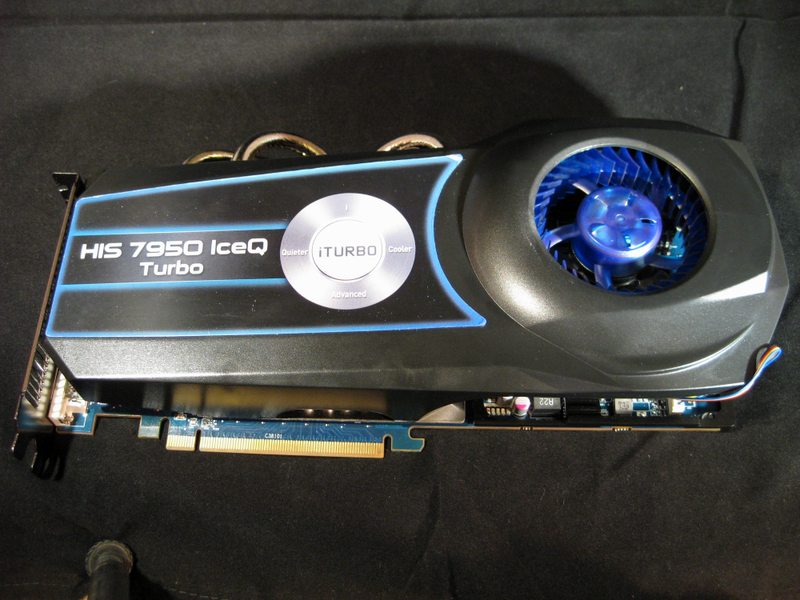 In AvP, the HIS 7950 IceQ Turbo manages to best both the 670 and 680 coming in at 58.8 FPS stock and 70 FPS overclocked. Plenty of FPS to run this game at its highest settings, without any hiccups at our test resolution. Moving on to Batman:AC, we see here the 7950 at stock speeds only falling behind the mighty GTX680 at 70 FPS. However, once overclocked, again we see solid scaling from the large ’24/7 overclock I settled on, coming in at 84 FPS. Again, in this GPU intensive game the average FPS is plenty to run the settings listed. 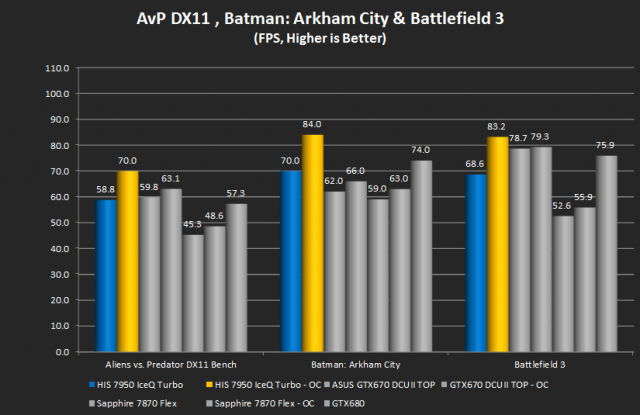 The last game in the first graph is Battlefield 3. In this case the 7950 is looking up at both the GTX670 and GTX680 by a fairly decent margin (68.6 for the 7950, and 78.7/75.9 respectively for the Nvidia cards). Of course in BF3 its still easy for this card to run with the default “Ultra” settings in BF3. 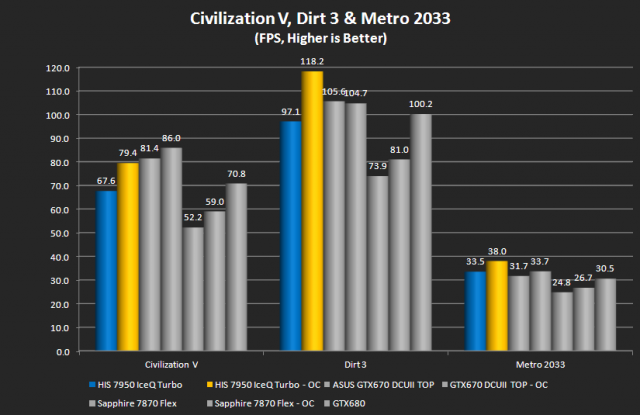 In the next graph, we start out by looking at an oldie but a goody in Civilization V. In this benchmark the 7950 was able to spit out 67.6 FPS, again falling ‘in order” to the comparison cards from NVIDIA. 60 FPS+ is plenty to have a nice DX11 gaming experience in this game. Dirt3 is one of my favorite racing games and it just looks beautiful to me with the settings on Ultra. Though things look awesome in game, getting good FPS isn’t terribly difficult to be honest The HIS 7950 pounds through this game at 97.1 FPS stock, falling slightly behind the GTX670 and GTX680. Last but not least is a game that brings GPU’s to its knees, Metro 2033. Here, with the settings we use, most cards are brought to their knees and barely break the 30 FPS mark. In this case our test card managed to best its counterparts coming in at 33.5 FPS and keeping above that magical “playable” number. The IceQ cooler strapped on to the 7950 did a very admirable job overall. 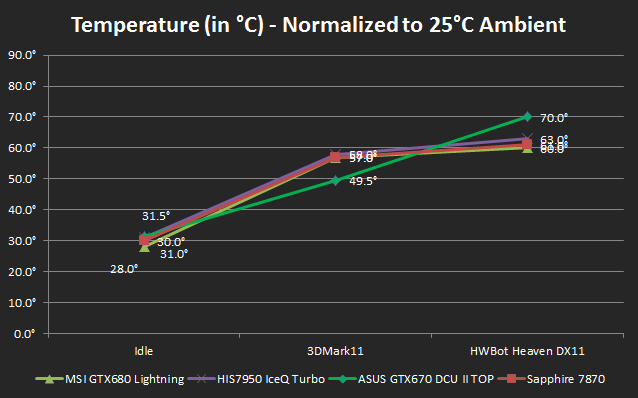 At idle in a normalized ambient of 25 °C, she sat 30 °C with 30% fan speed. The card peaked in our testing at a cool 63 °C with the fan spinning up to 45% at that temperature, which was pretty quiet in Heaven. In 3DMark 11 the temperature was slightly lower at 59 °C, which seems to be a sweet spot for the cards used in the graph for some reason. As far as power consumption goes, the TDP for the 7950 weighs in at 150W which is a bit less than both the GTX670 and 680 (170W and 195W respectively). We see a surprisingly close race throughout which surprises me a bit due to AMD’s ability to really cut back power to a supposed 15W at idle, and an even lower 3W with ZerCore Power. The peak power number was 289W through testing. Ahhh…back to the fun stuff! 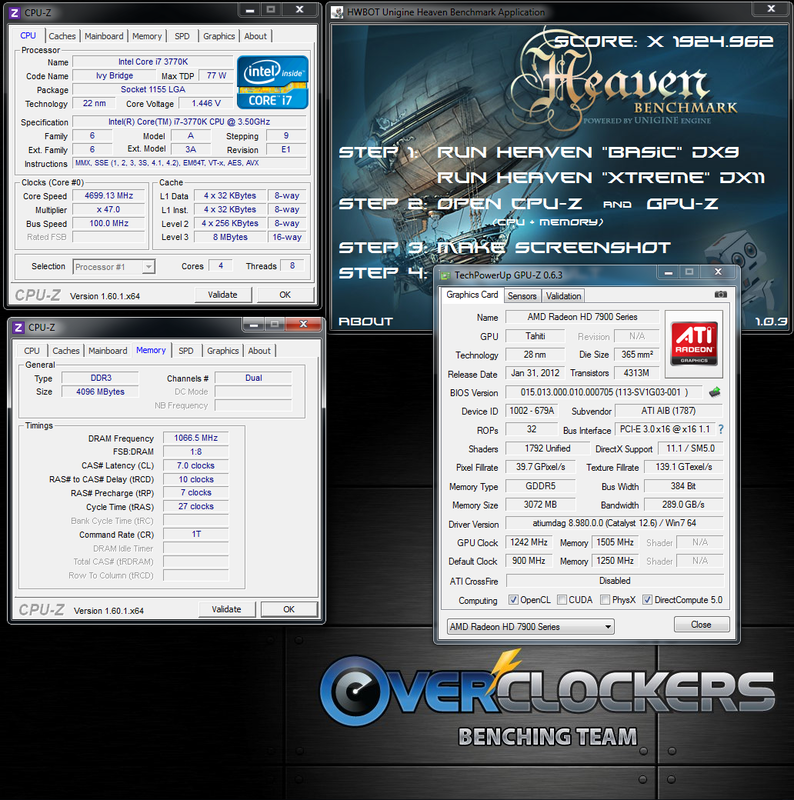 I ended up using a 4.7 GHz overclock on the 3770K for this testing. 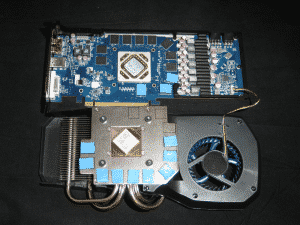 The video card ended up with 1242 MHz on the core and 1505 MHz on the memory while using the stock voltage. Those settings yielded some significant gains, especially due to the CPU in Vantage and 11, ending up with 36,756 in Vantage and 9,489 in 11. The last test I pushed hard on the card was Heaven. 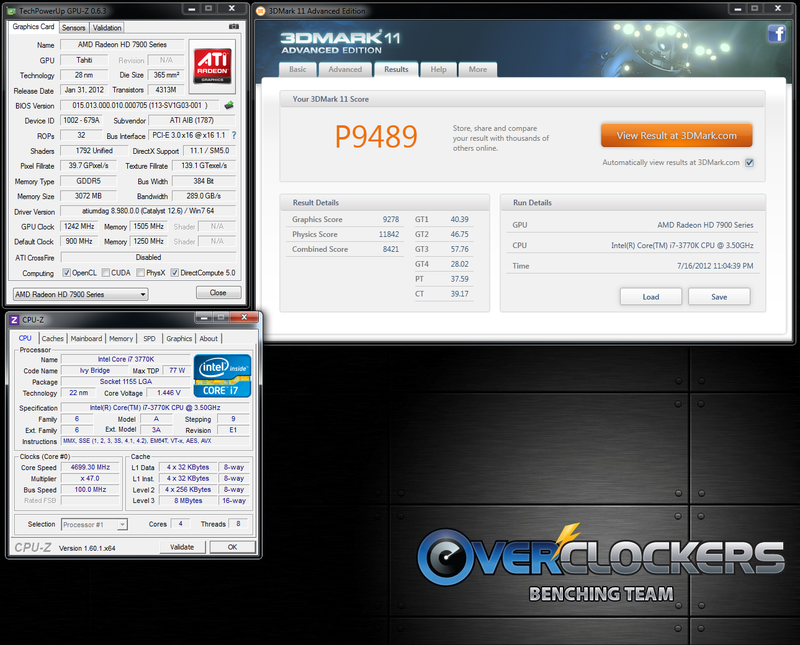 In this benchmark though, I didn’t see any gains and actually lost a few points from the earlier overclocking. I tried to lower the clocks to see if I was unstable, but I just wasn’t able to match the score I received with a lower clock. As a lot of us know already, you do not see much gain at all from Heaven in CPU, so the results in this bench were a bit disappointing in the end. After looking back at my experience with this card, there are some good and some bad to reflect on. First, the HIS IceQ cooler, while an effective solution over the reference cooler, had its shortcomings. Most notably its fan rattle around a specific RPM, some coil whine (not all would have this of course), as well as me thinking that the solution could have been made without such a large gap between the heatsink and the ram modules. To be fair, it’s still effective, but the gap could be smaller there resulting in better performance of the cooler, and potentially higher memory clocks for those pushing the limits. There was also not a lot of room to get the PCIe plugs out from their spot due to the lower clearance between the latch and the base of the cooler. The other concern was the fan header sliding off. Again, not a huge deal, it slid right back on, but that should not come off. The last drawback to mention is the price compared with similar cards. This card can currently be found for $389.99 at newegg.com. 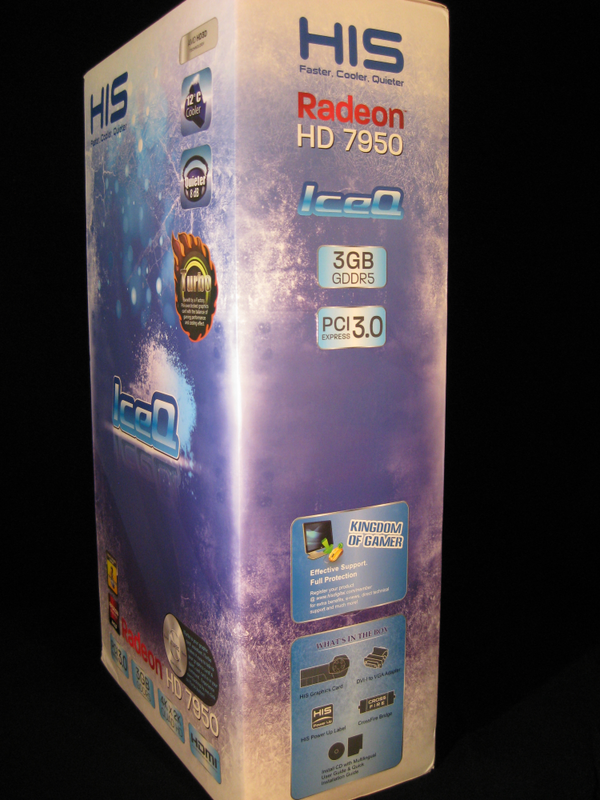 This is the second highest price out there only behind an Asus Direct CUII TOP model with similar clock speeds. The positives about this card are that this sample does like to overclock well. Sitting at 1242 MHz is pretty solid for a daily driver overclock, and the memory at 1505 MHz with plenty of headroom left there. One other feature outside of the cooler that sets this card apart is that you can manipulate the ram voltage to push the clocks even further. 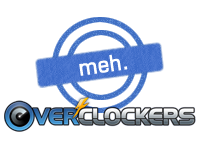 This is a solid feature putting it up there with the likes of the DirectCUII version of this GPU, so that is a nice value added for overclockers. The card does run cooler and quieter than reference as advertised, as well as expelling most of the heat load out of the case. So you have a lot of things going for it as well. With the same version of this card without a factory overclock coming it at $359.99, I really think the best value is in that card and not in this one with a $30 gap between them. This is a good card, make no doubt about it, but there are other choices out there with similar features for less money. 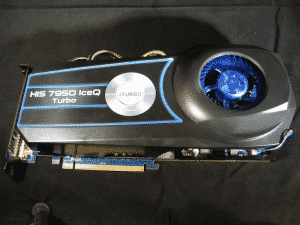 At its current pricing, and with the minor issues that may or not be a singular issue with my sample, the HIS 7950 IceQ Turbo warrants a MEH this time around. Drop the price $20 or so all around (on the non Turbo version) and then HIS would have two cards that should be a a strong consideration when looking for a 7950. Thank's EarthDog. a clean and fair review, as usual. 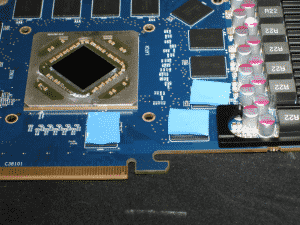 Reading through your comments about the Cooler over the RAM Chips i think this is a bit of a poor design on some of these cards, not just the IceQ. I would like to say something about how AMD cards are coming along in general, if i may. 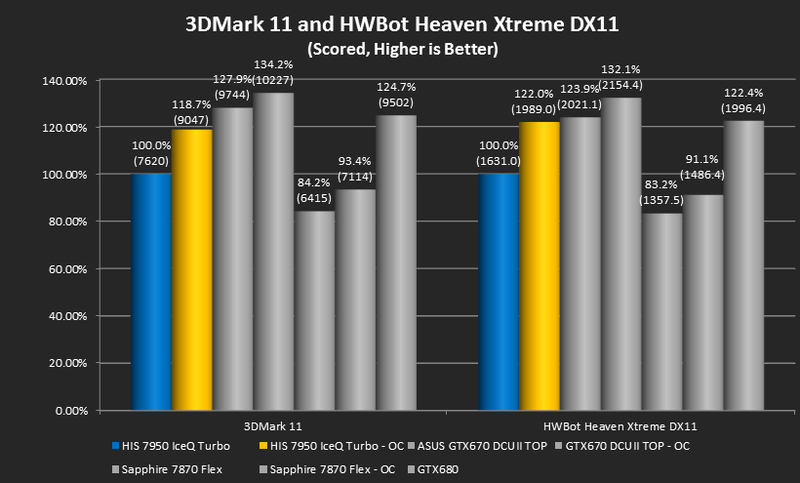 Nothing deep, just that i'm impressed about how much they have improved with the latest offering of drivers, the high end AMD cards are now absolutely comparable with high end nVidia cards, as your Graphs here, and others show. ...the Cooler over the RAM Chips i think this is a bit of a poor design on some of these cards, not just the IceQ. No doubt. However, on this model, the gap seemed abnormally large. To be fair, it didnt seem to hinder things much though, but still could have been better allowing, potentially for even cooler temps and higher overclocks since this card has memory voltage control. 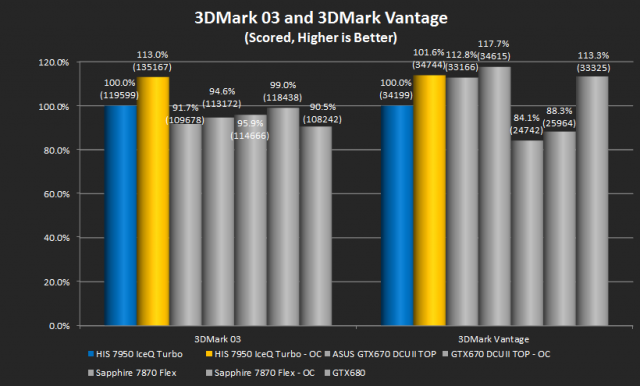 The performance driver recently released has been huge for AMD IMO. Its a back and forth game of one upsmanship between the two camps and their drivers (and cards of course). At this time, it really depends on the game and the overclocks for the performance of comprable cards (power consumption, and other things not included). The game of one upsmanship is good for us (stating the obvious i know) just as long as AMD and nVidia can both continue to be so close to continually swap performance for $ positions we win. As for the thing i found with my card, i will take a picture in better light tomorrow so you can see exactly what i'm talking about, its not good. I'm going to phone ocUK about RAM'ing it when i'm not using my Desktop for a while. Nice review like usual. Does seem a shame that a card with that potential is hindered by a poor HS design in regards to ram IC contact with HS. Hopefully they will correct that issue on other cards.